You are currently browsing the tag archive for the ‘Jacqui Smith’ tag. On Saturday afternoon over 30 people joined with No Borders South Wales outside Newport Passport Office to protest against the introduction of ID cards for non-EU foreign nationals resident in the UK from this November. Thousands of copies of our new leaflet “Big Brother is coming“, produced especially for the event, were distributed to members of the public. 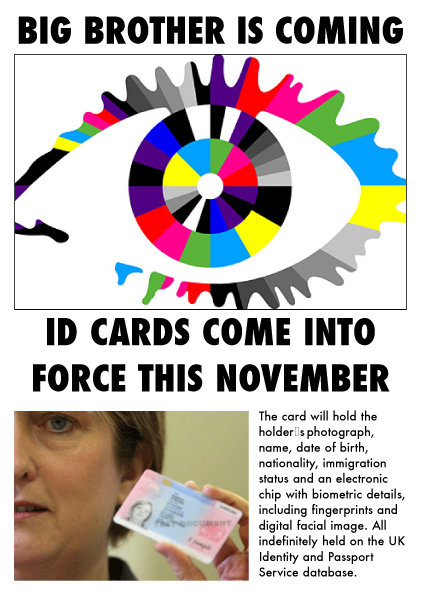 The leaflet lays out the government timetable for rolling out the scheme and makes the point that these new ID cards are not only a repressive measure against migrants, they are the first shot in an attack against everyone’s freedom. The vast majority of passers by who took the time out to speak with people on the demonstration were very supportive of our campaign and were adamant that they would not accept an ID card themselves. A dozen police were waiting by the Passport office at 2pm when people arrived. The senior officer informed people that they were willing to ‘facilitate’ the protest providing only two people were stood outside the entrance to the passport office and everyone else stood on the other side of the road. The police were politely but firmly told that that was both unreasonable and unacceptable. The officer then said he would go inside the office and then return to implement “another course of action”. Unsurprisingly, this other course of action was to completely abandon his original demand and only ask us not to block the entrance, which we had already told him we had no intention of doing. 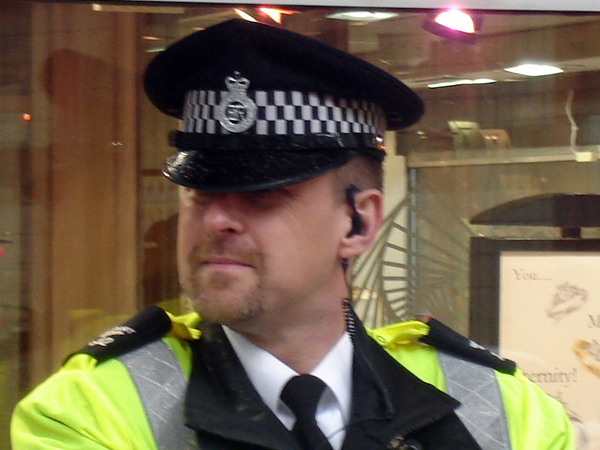 Though in this case the police soon realised we were not going to be bullied around and the protest was able to pass off without too much of their interference, it is a concern that less experienced people wishing to exercise their legal right to protest are intimidated into being sidelined into designated “protest zones”. 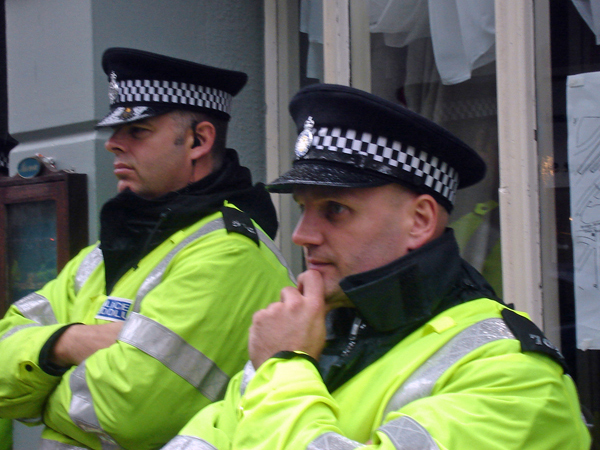 Across the UK police forces regularly demand that protest organisers contact them beforehand, despite the fact we all have the right to gather and protest without asking for permission. Under the guise of “minimising disruption” and even protecting the protest from disgruntled members of the public(?!? ), it is increasingly common for police to view an effectively policed protest as one which as few people as possible are aware is happening. A good example of this was the march against the military academy in Cardiff which the police forced out of sight down back-streets, earlier this year. Latest of those soft targets are overseas students, and people seeking to settle in the UK with British husbands and wives. Those, people with strong reasons not to make a fuss, are the ones to be targeted for the new biometric card scheme that will act as a test bed for the ID scheme. Jacqui Smith’s launch of “ID cards for foreigners” was a shameless piece of spin to try to associate the unpopular ID scheme with the popular policy of restricting immigration. It comes to something when a supposed opponent of the database state is inventing meaningless spin for the government as they are about to introduce the first ID cards! It is a shame that this new move by the home office is not recognised by more anti-ID activists for being what the government is very open about. This unwillingness to defend the rights of migrants endangers the struggle for everyone’s liberty. Previously Defy ID has been a vehicle for opposition to ID cards from a libertarian perspective, but given the manner in which the government is using a a greater repression of migrants as a testing ground for this scheme No Borders must intervene. Jean Pierre Gueutchue is currently detained at Campsfield House IRC and is due to be forcibly removed on July 21st at 8pm on Kenyan Airways Flight 101. 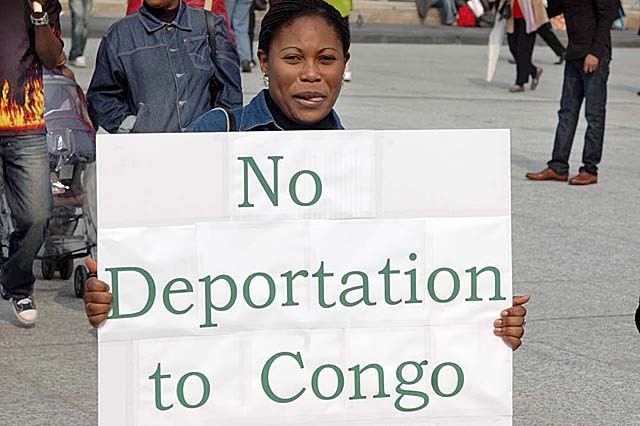 Jean Pierre fled Cameroon and arrived in the UK in 2003 where he made a claim for asylum. In Cameroon he was imprisoned and tortured for his political activity with the Southern Cameroon National Council (SCNC), a secessionist movement that has been declared illegal in Cameroon. In prison he was subjected to torture including being kicked, whipped and a practice called ‘falaka’, which is a where a victim’s legs are tied together and soles of the feet are beaten with the flat surface of a machete. Jean Pierre suffers flashbacks, intrusive memories, nightmares about being tortured and is being medicated for depression, post traumatic stress disorder and sleep disturbances. Jean Pierre also suffers from Hepatitis C and Cardiff’s University Hospital of Wales has stated that it is vital that Jean Pierre’s health is reviewed in relation to his Hepatitis C treatment in October this year. In the light of the current situation facing members of the SCNC in Cameroon and Jean Pierre’s health status, he should be offered protection in the UK. See Jean Pierre’s campaign page for more background information. 1) Send urgent faxes immediately to Rt. Hon. Jacqui Smith using this model letter, Secretary of State for the Home Office asking that Jean Pierre Gueutchue be granted protection in the UK. 2) Send urgent faxes to Sam Okwulehie, Group Area Manager Kenya Airways using this model letter, urging them not to participate in forcibly removing a victim of torture.